What better way to start a cold day than a rich creamy cup of golden curcumall latte? Your whole body and soul will thank you for giving it such nourishing start of the day. 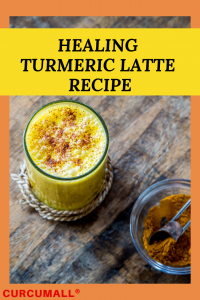 You will enjoy this power-charged turmeric latte recipe even more, when you realize how powerful are its ingredients. Turmeric and its active component, curcumin, have anti-inflammatory, anti-oxidant, anti-viral and anti-cancer properties. In this specific recipe I use Curcumall® instead of just regular Turmeric. One challenge with turmeric is proper absorption. It is difficult for your body to absorb enough of the nutrients to make a difference. However, Curcumall® is a specialized liquid extract of Turmeric and Curcumin C3 that offers more free curcumin at the cellular level. It is easy to ingest, is highly concentrated and readily absorbed. Taking Curcumall® on a regular basis may help in the prevention and treatment of several disorders, infections and assist in eradicating toxins from the body. Read here how Curcumall® can help you avoid the flu this winter. Try this power-charged turmeric latte for a few days. You will notice the difference in how you feel! As the milk heats, whisk the ingredients together for about three minutes until in becomes frothy and smooth. Enjoy your healing turmeric latte!